This pendant light is provided by Unitary Home World. We are a professional lighting manufacturer, and ensure that provide you the best quality and the most abundant category of lighting products. All products in factory have to undergo a rigorous safety monitoring, so you can use them safely. Its finish is bronze, and color is bronze. The diameter of the light is 12 inches, height of entire light is 51 inches, height adjustable. There is 1 E26 bulb socket, the maximum compatible wattage of one bulb is 60W. So the power of item is 60w. (bulbs not included). High quality,2 years guarantee.Installation type:Hardwired. Product Dimensions:12x12x51 inches. Suggested Space Size:5-10 Sq.m. 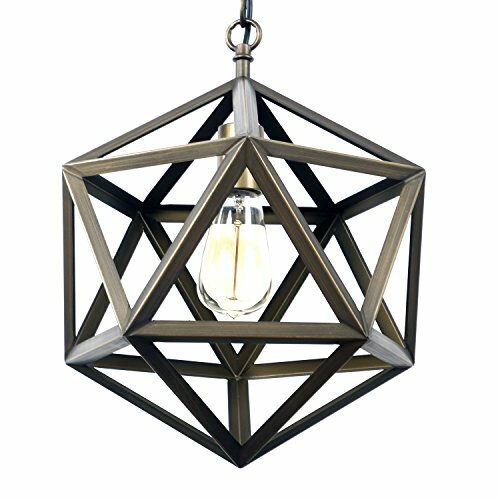 It's the perfect light fixture to install in living room,hallway,foyers and more. Voltage:120V for North America.Max. Power:60W Bulb not included. If you have any questions about this product by Unitary, contact us by completing and submitting the form below. If you are looking for a specif part number, please include it with your message.